Matilda, the granddaughter of Wigod, the Saxon thegn or lord of Wallingford in Berkshire, was sufficiently wealthy and powerful to have her own seal for the authentication of documents, even after her marriage. 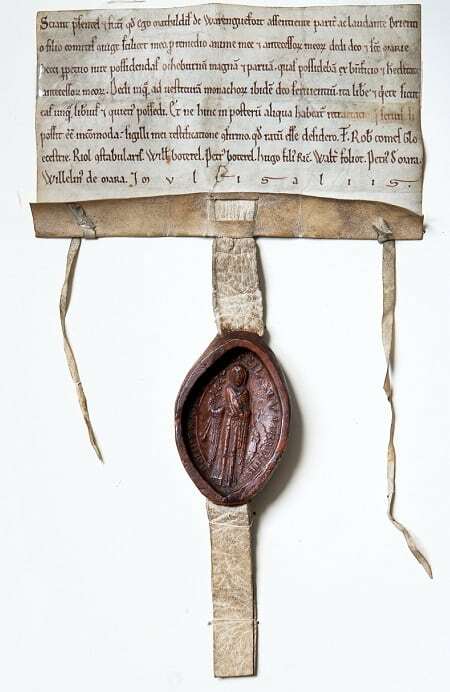 One of the earliest examples of a medieval lady’s seal to survive in this country, the fine wax impression of her twelfth century seal features as the image-of-the month. Matilda (or Maud) was the daughter and heir of Robert D’Oyly, a Norman warrior who had assisted William the Conqueror to victory in the Norman invasion of 1066. Once settled in England, Robert married a Saxon heiress, Ealdgyth, the daughter of Wigod, lord of Wallingford. After Wigod’s death, Robert D’Oyly held property in Wallingford “iure uxos” (by the right of his wife). Matilda was their only child, and the lordship of Wallingford passed to her and her first husband Miles Crispin (whom she married in 1084) who, according to Dr Keats-Rohan, himself owned land in Wallingford. Indeed he may have been the builder and first castellan of Wallingford Castle rather than Robert D’Oyly. After Miles Crispin’s death in 1107, Matilda married (in about 1114) Brian Fitz Count, one of the illegitimate sons of the Duke of Brittany, who was a protégé of Henry I. In the civil war that followed Henry I’s death, Brian Fitz Count and Matilda supported Henry I’s daughter, the Empress Matilda, against her cousin, King Stephen, holding the castle of Wallingford against him between 1139 and 1152. It was to Wallingford that the Empress fled in 1141 after a daring night-time escape from Oxford. Despite being a married woman, Matilda continued to retain some degree of ownership in the property she had inherited from her father and first husband and was able to make grants in her own name, albeit with the approval of her husband. The parchment document to which this seal is affixed is a grant by Matilda of Wallingford to the Abbey of Bec in Normandy of property in Great and Lesser Ogbourne in Wiltshire in return for prayers for the salvation of her soul and the souls of her ancestors; the income from the grant was to pay for clothing for the monks there. Greater and Lesser Ogbourne (now known as Ogbourne St George and Ogbourne St Andrew) formed part of the lordship of Wallingford formerly owned by Wigod. The deed is undated but must have been drawn up during Matilda’s marriage to Brian Fitz Count (c.1107 to c.1147), since it records his approval to the grant. British History Online narrows this date-range to between 1122 and 1133 (British History Online). Matilda’s association with Bec seems to have arisen from her first husband Miles Crispin’s connections with the Abbey. Miles was almost certainly a member of the Crispin family of Neaufles in Normandy, and a relation of Gilbert Crispin, a former monk at the Abbey of Bec, who became Abbot of Westminster, and of his brother, Milo Crispin, precentor of Bec. During his life-time, Miles Crispin endowed Bec Abbey with the manor of Swyncombe and with valuable tithes from his demense. Matilda increased this endowment after Crispin’s death with the grant of the manors of Greater and Lesser Ogbourne, with their parish churches. It is believed that she became a nun towards the end of her life and died in the 1150s.